Even though he's only 10, Sean Oppenheimer already knows what he wants to be when he grows up: the president of the United States. 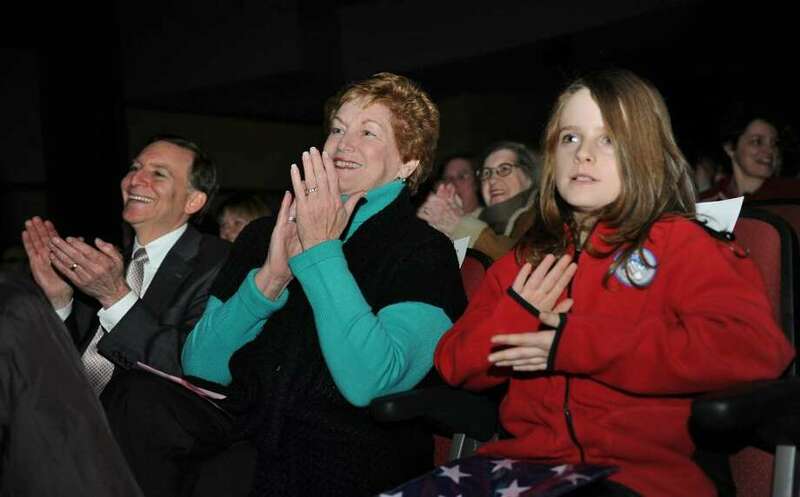 And the Osborn Hill School fifth-grader is already hard at work lining up political allies. Sean's invitation to Gov. M. Jodi Rell to attend the school's annual variety show Friday has been accepted, and according to Rell's scheduler, the governor plans to attend unless an emergency arises. He had extended an invitation to Rell once before, to attend the school's Harvest Fair. She couldn't make that event, but sent Sean a hand-written note thanking him for the invitation. The note went into a black binder that holds letters to Sean from the current president, Barack Obama and his wife, Michelle, as well as Bill Clinton, Al Gore and even the Statue of Liberty. Well, the Statue of Liberty letter actually came from the National Parks Service. And he did write a letter to Santa, but that guy never answered. Sean, who showed up for his interview dressed in a pin-striped suit and a tie, even signs his letters, "TFPOTUS" -- The Future President of the United States. In his letter inviting Rell to the variety show, Sean writes: "Since you are the governor of our state there should be no tickets necessary. There are tickets for other parents and students, but you are free." He does warn Rell to "prepare for screaming" from an enthusiastic audience when the acts start. Sean fully expects the governor to attend. "It's Friday, what kind of an emergency can there be?" he said. He won't be performing in the show this year, he said. "I'm just going to stay with the governor and watch the show," Sean said. Parents Gordon and Sheila Oppenheimer said they aren't politically involved, but it could be that the politics gene skipped a few generations. Hanging on the wall in Sean's room is a framed photo of his great-grandfather, Patrick Kenney, who once served as mayor of Glen Cove, N.Y. The youngster has posted videos on YouTube (www.youtube.com/watch?v= PJRoCyZApS0) espousing his thoughts on health-care reform, and America's attitude toward Cuba. He's stood outside the polls greeting voters with Board of Education member Tim Kery, and campaigned for Obama with First Selectman Kenneth Flatto. "I'd like to do some work on America," Sean said.